Why is productivity so low in the Start-Up Nation? 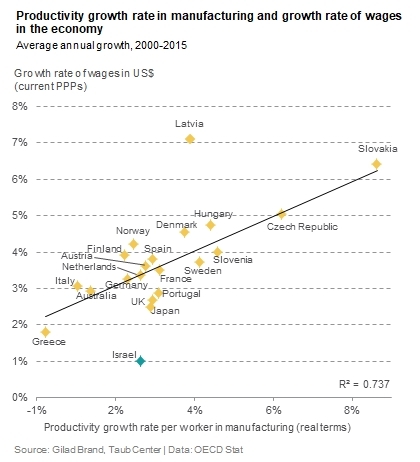 The Israeli economy is characterized by low productivity, and thus a low standard of living, despite its being a world-class leader in the high-tech field. Why the paradox? A new study by Taub Center Researcher Gilad Brand shows that the problem lies in the exceptionally large gap in the Israeli labor market between the size of the high-tech and exporting sectors, which are characterized by high wages and rapid growth, and the rest of the market with its low salaries and slow growth. According to the research, the success of the thriving sectors in Israel, unlike in other developed countries, has had little impact on the rest of the economy. Believe it or not casino players have been from generations and generations of people who love the game and play them at very early ages. It is common to see people being a great fan of these games and spending their free time browsing on the Internet to find various choices. sitting at home.One of the most common casino games people enjoy to play for fun is the free online slots. from the comfort of the properties. Among other things, this is because of low labor mobility which has resulted in the development of two separate economies. In light of these findings, it appears that government support of the high-tech industry has limited impact on the rest of the market and, therefore, other forms of intervention should also be considered. High-tech employees in Israel earn more than double what employees in the rest of the business sector earn; this ratio is much higher than in other OECD countries. Achievements of high-tech workers on the survey of adult skills (PIAAC) are higher than the OECD average, though the achievements of the rest of the workforce are lower than in 20 of 25 other OECD countries. Israel has import restrictions that diminish the volume of trade – the share of imports out of the GDP stands at about 28% and is ranked low relative to other OECD countries. This policy primarily harms the non-high-tech exporters that are characterized by lower profit margins by supporting the strong shekel. Israel is often referred to as the “Start-Up Nation,” but the country’s success in the high-tech industries is not necessarily shared by all, and the overall productivity rate, which is tightly linked to the standard of living, remains low relative to other developed countries. A new study by Gilad Brand, a researcher at the Taub Center for Social Policy Studies in Israel, looks at the relationship between the different sectors in the country and shows why the growth that has characterized the advanced technology sector has not trickled down to the rest of the market. According to Brand, the central reason for differential growth between the sectors is that Israel has especially large disparities between the exporting sector (which is primarily made up of high-tech and advanced technologies) and the local sector. Economic literature shows that productivity and growth in exporting sectors are higher than in local market-centered industries because companies that export are exposed to a greater extent to world technologies, face fierce competition in the world marketplace and gain experience from exposure to new markets. This growth would be expected to trickle down to the rest of the market through labor mobility: the high productivity in exporting sectors raises wages and demand for workers in those industries, and because of the decrease in the supply of labor in sectors supplying the more local market, wages rise in those sectors as well. Higher wages in the exporting sector should incentivize local industries to make investments in capital and in technology, and to improve efficiency in order to remain profitable. Through this mechanism, productivity and wages in all sectors would rise. Indeed, in those countries where productivity in the export sector has improved over time, workers’ wages in the other sectors have also increased. As seen in this graph, the Israeli economy remains exceptional in the weak relationship between the two variables, and the purchasing power of workers in Israel has grown at a slower pace than expected. According to Brand, the process that is observed in most countries doesn’t hold in Israel because the differences between workers in the two sectors are very pronounced. For example, the average score of workers in Israel’s local sector industries in an international survey of adult skills (PIAAC) is lower than in 20 of the 25 OECD countries in the sample, despite the fact that their formal education is relatively high. Workers in the export sector, on the other hand, had scores that were a bit higher than the OECD average. The difference between workers in the two groups is the highest among the 25 OECD countries in the sample. This leads to a lack of mobility between the two sectors, and thus the mechanism of labor mobility, as described above, does not occur. That is, the growth of productivity in the export sector does not result in wage pressure in the local market. Wage differentials in Israel are therefore particularly high. 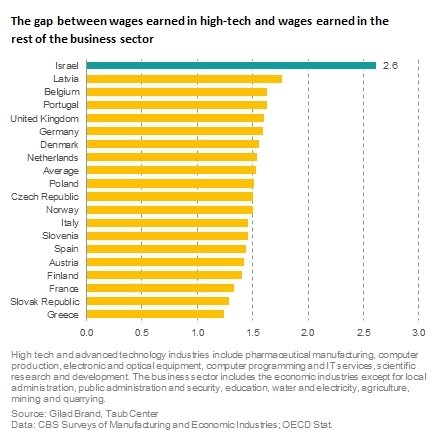 Workers in high-tech earn over double the wage earned by workers in the business sector, and this gap in wages is excessively high compared to other OECD countries. Does investment in high-tech have an impact on the rest of the labor market? The data in the Taub Center study show that, due to the particular composition of the labor force in exporting industries, the success of this sector does not drag other sectors in the economy along, as we witness in other OECD countries. In light of this, Brand raises the question whether current government policy, which supports heavy investment in high-tech, can be expected to bring about a rise in productivity in other sectors. Brand’s research also shows that the composition of exports in Israel is highly concentrated and largely rests on high-tech and advanced technologies: 56% of those employed in the export sector work in high-tech – almost double the OECD average and the highest share out of all the countries examined. Over-reliance on a small number of industry areas that require highly trained and skilled labor means that other workers are unable to enter the sector (because of the level of training required) and benefit from high productivity and wages. The concentration of high-tech products in the export sector is the result not just of Israel’s relative advantages in the field, but also of incentives given to this sector over the years in an effort to encourage capital investment and of age-old government policies regarding international trade. These directly contributed to the concentration of Israeli exports since they encouraged the expansion of several large exporters, which came at the expense of others through resulting changes in the exchange rate. These changes are particularly damaging to non-high-tech exporters characterized by lower profit margins. For these types of companies, small changes in the exchange rate can make the difference between successful exporting and remaining limited to the local market. In light of the conditions described above, additional investment in high-tech is unlikely to improve productivity in other sectors, yet direct investment in non-trade sectors also contains risks. The potential for growth in sectors producing mainly for the local market is low – the industries in these sectors are less impacted by new technologies and are more reliant on local demand alone, something that is, by its very nature, limited and dependent on the level of income in the local market. The data in Brand’s study show that despite the sharp growth in the service and trade sector, its share in the GDP has remained almost identical over the past four decades (45-50%). A growing percentage of workers divide the share of the GDP that is not growing. In addition, the local sector is characterized by a relative abundance of low-wage workers, so companies have no strong economic incentive to adopt new technologies that would save manpower. What is more, incentives to encourage investment in local industry may improve productivity, but there is also a risk that this would be at the expense of workers who might be replaced by technology. Adopting advanced technologies is likely to push low skilled workers out of the low productivity sector and possibly into unemployment. It seems that improving productivity – which is so necessary for raising the standard of living – will be achieved if workers move from the local sector to the export sector. The data point to a relative abundance of workers in occupations that serve the local market and a lack of workers in the export sector. The Taub Center study indicates that having better market conditions could also encourage exports and allow more companies to benefit from the advantages of exposure to international markets. The Israeli market is characterized by a plethora of trade restrictions, among them a great deal of regulation, special standards for Israel, and burdensome arrangements for competing importers. These restrictions make it difficult for new competitors to enter the market. As a result of this, Israel imports only 28% of its GDP – less than the majority of OECD countries – and this percentage has been declining over the past decade. The level of imports determines, to a great extent, the level of exports (through the mechanism of the floating exchange rate), so Israel’s exports are also relatively low and declining, as is the share of employees in the export sector in all segments except software programming and IT activities. Thus, the dependence of the export sector on high-tech continues to grow. The decline in the volume of trade prevents the market from fully utilizing its relative advantage and does not enable the economy to reach its full potential in the long run.